Every semester as a student, I feel that each semester goes by faster and faster. The weeks tend to fly by and before I know it, it’s the end of the semester. Last night, I turned in my final paper and officially am done with my fall semester. Towards the end of the semester, things tend to get busy with final projects wrapping up, papers to turn in, and exams to prepare for. While it can be overwhelming if you don’t stay on top of things, I find it to be my favorite time of the year. It’s really a chance to reflect on all you have learned and done throughout the semester. 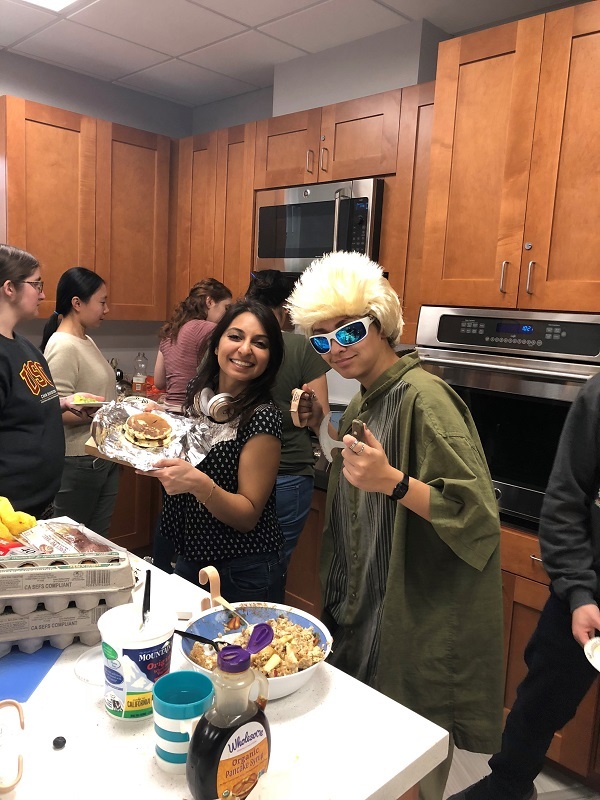 In our OT 501: Adult Physical Rehabilitation last lab, we had an adaptive cooking lab. 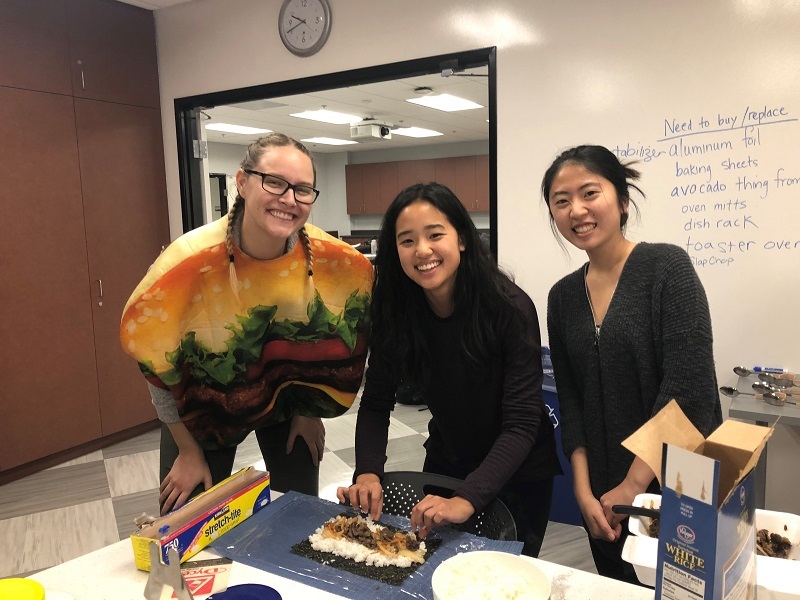 This was a chance for us to try different adaptive cooking utensils ourselves hands-on! 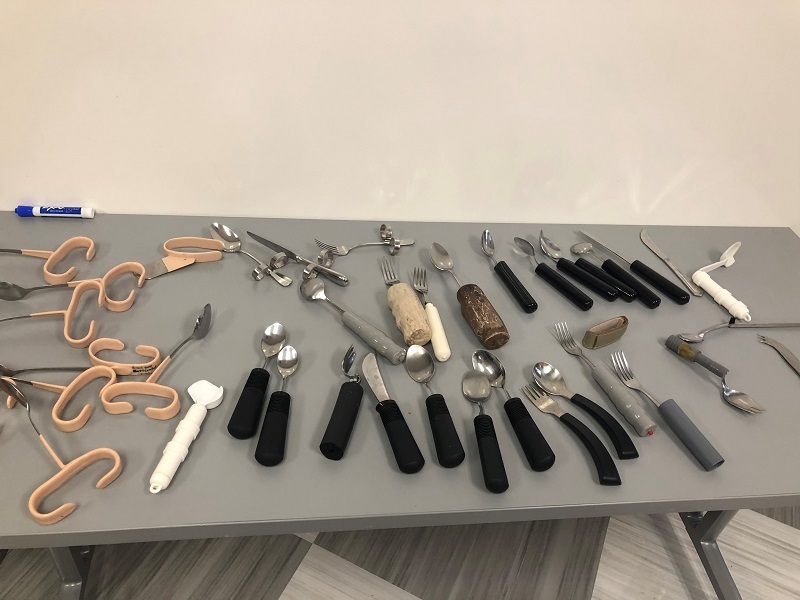 We held a potluck style breakfast and all brought in food to make and eat with different tools. In OT 537: Occupation-Centered Programs for the Community, we presented our program proposals that we have been developing all semester long. 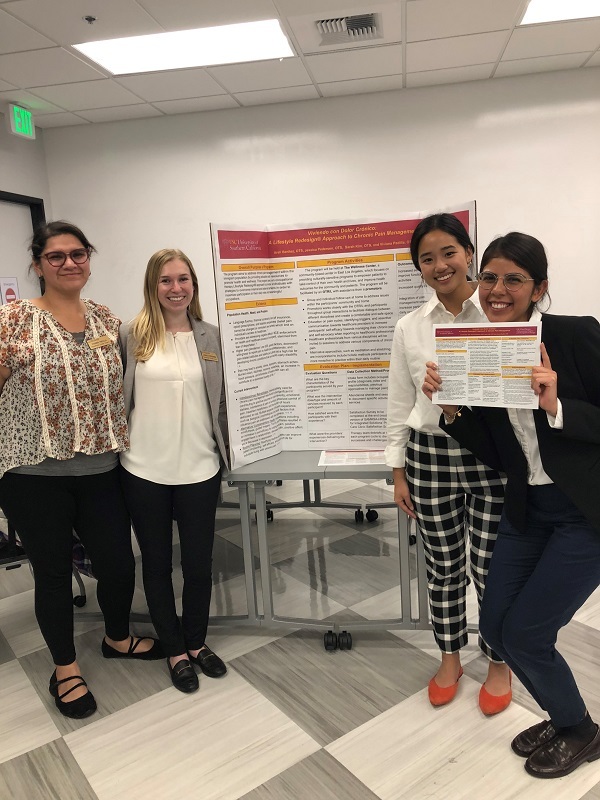 My group and I created a program called “Viviendo con Dolor Cronico: A Lifestyle Redesign Approach to Chronic Pain Management” which is focused on chronic pain in the immigrant population. Lastly, we had our last class together as an entire cohort. 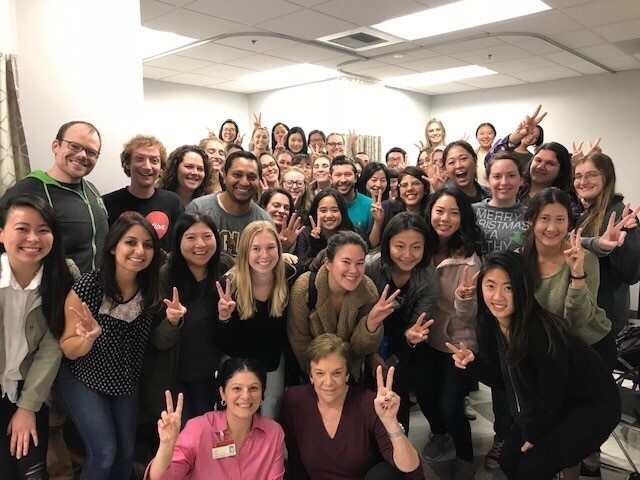 Being together since day 1, our cohort has gone through all three of the immersions together: mental health, pediatrics, and adult physical rehabilitation. Next semester, we no longer will have a class all together as a full cohort as we will be taking different electives in the areas we are individually interested in pursuing. And just like that … the semester is over. Soon, I’ll be heading home for winter break to relax and spend time with family (and mostly cuddle with my dogs). I hope you all have a relaxing holiday! Coming back from Thanksgiving break, I always have such an appreciation for some of my favorite things in life: family, food, friends, and football. This time of year it is so nice to take a step back and remind myself of everything I have to be grateful for, especially for having the opportunity to pursue the career I love (occupational therapy, duh!) at the best university, USC! This semester has truly been a whirlwind, full of making plans for the future and slowly coming to terms with the fact that I only have one semester left as a full-time student in the master’s program. It can be easy to get caught up in applying to different OTD residencies or figuring out where to go for my leadership capstone externship next semester, but at the end of the day I always know that I am so lucky to have found this profession. 1. My group members. In two of my classes, a majority of the coursework is done amongst groups. I have been blessed to have gotten the best group members who make even the longest days enjoyable! From sending friendly texts to bringing each other snacks, my group members always go above and beyond. 2. Cohort B. I know, I know – everyone says their cohort is the best but let me tell you, my cohort actually is THE best. My cohort has been the best support system throughout this program. 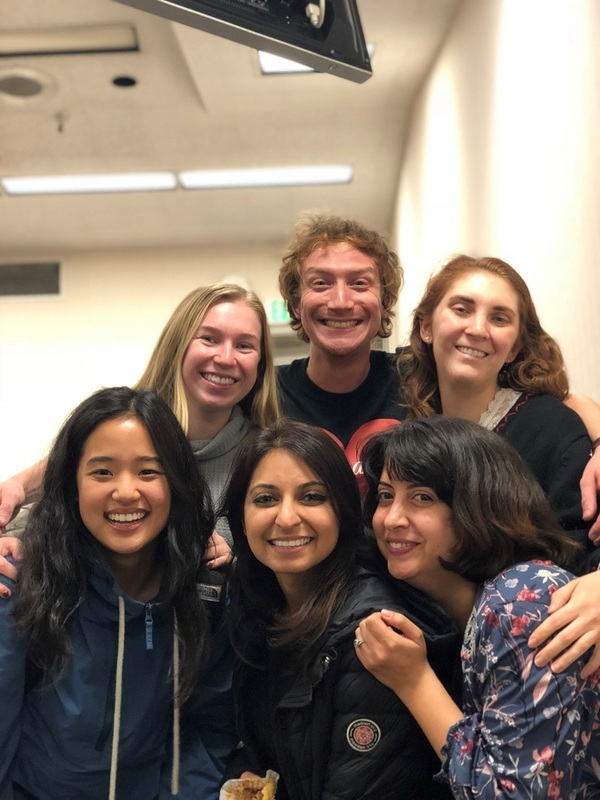 From planning potlucks on weeks where we are all a little run down to staying after class to help each other practice transfers to even planning weekend handball games, my cohort truly does it all. 3. Student Ambassadors. I am so lucky to be a part of the wonderful student ambassador team. While I love giving tours to prospective students and being a part of information sessions, my favorite part of this job is my amazing co-workers! 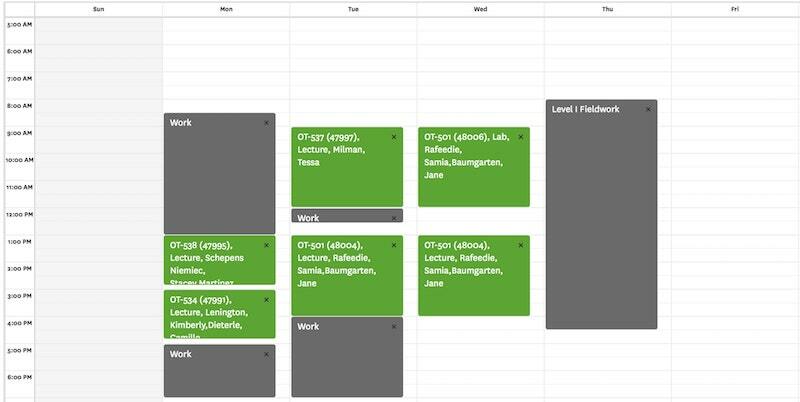 As an ambassador, one of the most common questions I get from prospective students is “what does your typical schedule look like?” Along with this, people ask if there’s time to work, time for self-care, and balance in your weekly schedule. My fellow ambassadors, Joyce and Evan, recently discussed working and having a baby in grad school. From my personal experience, I think it all has to do with balance. Throughout the program, it is typical to be in the classroom 3 days a week, 1 day in fieldwork, and 1 day off. For the days that we’re in the classroom, it is normal to have class 9am-12pm, a lunch break 12pm-1pm, and then class again from 1pm-4pm. For many people, like myself, a three-hour class may sound daunting, but it’s not. Luckily, all of our professors give us breaks with plenty of time to grab coffee, snacks, or simply take a quick walk outside to get some fresh air. Most of our classes utilize team-based learning, meaning that we usually are not getting a lecture for the entire class time. For example, in my Adult Physical Rehabilitation course we spend class time doing hands-on case applications where we apply what we have already studied on our own. Everyone’s fieldwork hours will be slightly different, as you will follow whatever hours your clinical instructor works. The hours occupational therapists work may look different in the various settings. For example, my pediatrics level I fieldwork was 10am-6pm as many of our pediatric clients were coming after school. This semester, I just finished my last level I fieldwork at an outpatient lymphedema clinic where my hours were 8am-4:30pm. As a student ambassador, I have the privilege to work 10 hours a week for the division doing various tasks and events. I have found working 10 hours per week is manageable, but it is something I have to plan for. I know that I have weekly quizzes on Tuesday, so on Sunday’s I study for my quizzes instead of cramming late on Monday night. Many of my classmates also work around 10 hours, doing other student worker positions at USC, such as being classroom assistants or research assistants. We probably would all agree that working that amount is doable, but anything more than that could be stressful on top of your coursework. One of my favorite days though is my day off. While I love being in the classroom and at fieldwork, I depend on my day off to recharge and prepare for the upcoming week ahead. By having a day off, I think it really allows us to have a balanced schedule with time to have doctor’s appointments, work, catch up readings, etc. Throughout grad school, there will definitely be weeks where it can feel overwhelming. My best advice is to listen to your own body and what balance looks like for you. You may need a full 8 hours of sleep while some of your classmates seem to fully function off of only 5 hours, but always listen to what is best for you. 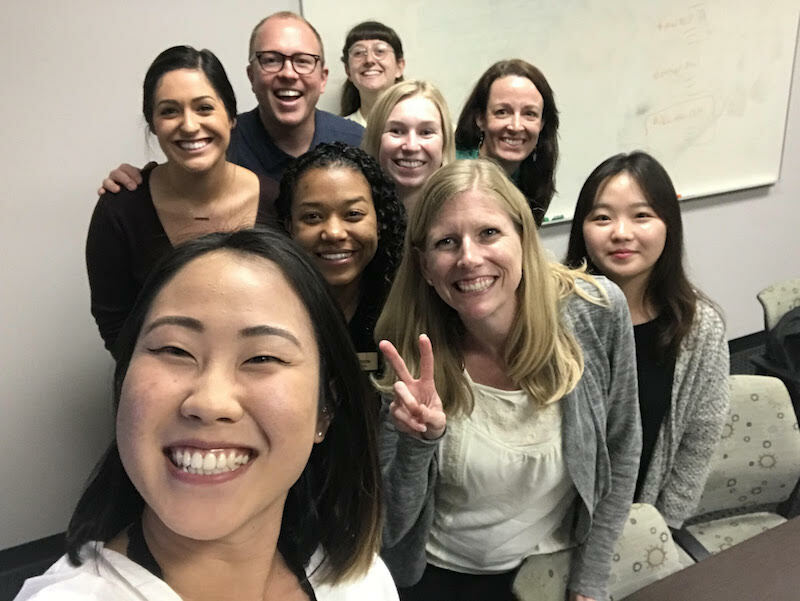 Transitioning to grad school is definitely a transition into a new role in life, but once you get a hang of the schedule and what works for you – you will own it! Growing up as a competitive figure skater, I was no stranger to frequent emergency room visits. From broken bones to run over fingers, I had it all. For me going to different orthopedic doctors and physical therapy was as much part of my weekly routine as going to school or practice. I think this is where my love of the healthcare fields grew. I knew firsthand how much different injuries impacted my own engagement in one of my favorite occupations, figure skating. And it was true, until this past year. 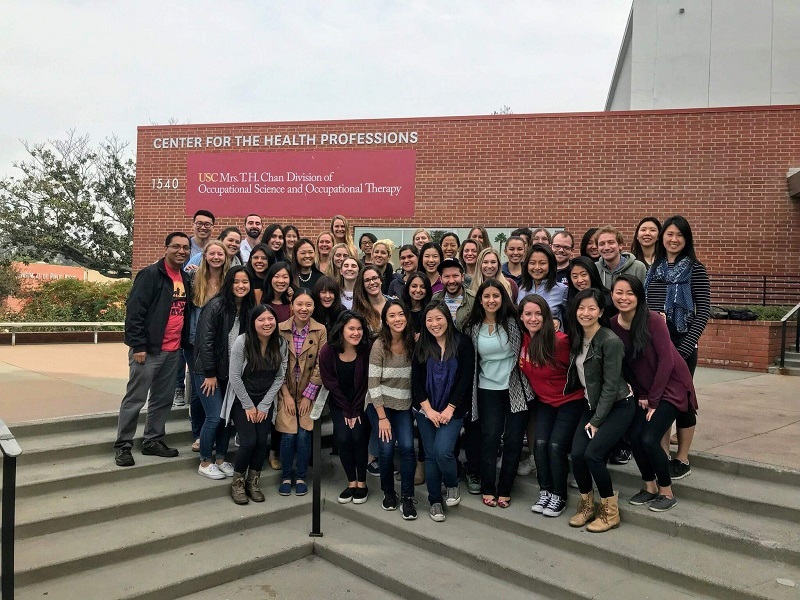 After a complication from a routine surgery in January, I spent the first week of my spring semester in Keck Hospital of USC. This experience completely changed how I look at and approach a lot of my patients, especially when working in an inpatient setting. I finally felt I could understand what it was like to be in this unfamiliar environment, in a bed that’s not your own, and machines beeping at all hours of the night. All I kept thinking was, I want to get back to class. My biggest role at that time was that as a student and because I wasn’t able to participate in that, I didn’t know what else to do. My interactions with my own healthcare team taught me lessons about what I liked from these providers and what I hope to provide to my patients. I think it renewed my therapeutic use of self, especially in taking an empathetic approach with everyone I encounter. While being a patient is not usually a fun experience, it was a valuable one. The semester is officially in full-swing and students here at USC Chan are immersing themselves in their Level I Fieldwork experiences. As part of our Level I Fieldwork, about halfway through the semester we have classes cancelled for the entire week and we get the opportunity to go to our fieldwork site for the whole week. This allows us to really see what it is like to be an OT in this practice setting. Last week, us second years had our full week and are now back on campus prepping for the second half of our semester. As part of my adult physical rehabilitation practice immersion, my fieldwork this semester is at an outpatient oncology and lymphedema clinic at Providence Holy Cross Medical Center. If you are anything like me, you may be unfamiliar with what OT’s role in lymphedema is. My clinical instructor is a Certified Lymphedema Therapist (CLT), which is considered an advanced practice area within OT. But wait…what even is lymphedema? When lymphedema occurs in oncology patients, it is called secondary lymphedema. This is when the lymph vessels aren’t able to adequately drain lymph fluid, usually from an arm or leg. Most of the patients that I see are breast cancer survivors who experience lymphedema of the arm or trunk. As part of their OT treatment, they come in for manual lymph drainage, which is a gentle massage guiding the lymph fluid towards areas where there are still good lymph nodes in the body. OT’s also have a critical role in educating and training patients on lifelong management of this chronic condition. It is complex and multi-faceted so OT’s may utilize all different interventions such as kinesiotaping, low-level laser therapy, scar mobilization, cupping, and so much more. One of the biggest things I learned throughout my full fieldwork week was how OT’s really play a role in enabling a patient to advocate for themselves. Many of our patients come to us after years of experiencing lymphedema. They haven’t received the treatment they need and have given up. We have the important role of being able to give them hope again, while utilizing an evidence-based practice and allowing them to engage in their meaningful occupations again!